The Beanpot Tournament has become a tradition like no other on the first two Monday nights in February each season. The annual event in which Boston College, Boston University, Harvard and Northeastern battle for Boston's hockey bragging rights, opens Monday with a doubleheader at TD Garden. New Jersey Devils forward Stephen Gionta, who played in four Beanpot tournaments as a member of Boston College, is very familiar with the excitement surrounding the games. Boston College has won the past four Beanpot tournaments. "In Boston, that's almost bigger than the national championship, especially around that area and the four schools playing in it," Gionta said. "It's a lot of fun to be a part of; I was lucky enough to win one as a sophomore [in 2003-04]." In addition to the 17,000-plus fans who will witness the games, the tournament will also give a few 2014 draft-eligible players an opportunity to make an impact and open some eyes in a pressure-packed event. "Obviously, over the years, we've seen a lot of good players at the Beanpot," NHL Central Scouting's David Gregory said. "There have been fewer draft-eligible players participating through the years, but this year there are two kids from Boston College we're focusing on." Boston College goalie Thatcher Demko, ranked No. 1 on Central Scouting's midterm list of the top draft-eligible goalies in North America, and defenseman Scott Savage, who is rated No. 161 on Central Scouting's list of the top North American skaters, are the only two players competing in the tournament ranked on Central Scouting's midterm list of North American players. 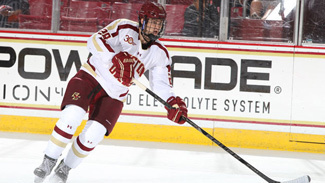 A product of the United States National Team Development Program in the United States Hockey League, defenseman Scott Savage is now turning some heads as a freshman at Boston College. The native of San Clemente, Calif., is very much looking forward to participating in the Beanpot Tournament beginning Monday at TD Garden. He's also good friends with Boston College goalie and fellow Californian, Thatcher Demko. "Thatcher and I are both from Southern California and have been playing with and against each other since we were 10," Savage said. "It's been amazing watching him develop into the great goaltender he is now. I was lucky to have him between the pipes in Ann Arbor with the Under-18 team and was thrilled we were going to be teammates at BC." Savage, ranked No. 161 on NHL Central Scouting's midterm list of the top draft-eligible skaters in North America, has three goals and 11 points in 21 games for the Eagles. "I like to play a reliable two-way game and love joining the rush and getting up in the play when the time is right," he said. "I try to keep things simple and consistent in the defensive zone so our forwards can get the puck up ice and get the offense going." With the U-18 NTDP last season, Savage had one goal and eight points in 55 games. "Savage has been playing better and better," Central Scouting's David Gregory said. "He's a kid we tracked last year on BC and has been through the draft once. But he's the kind of kid who is playing at a high level and could get a lot of attention since he is playing on a big-time team. He's playing in a good lineup and he'll get his due because he's playing at that level." Shootout move: "Snap shot, low blocker"
Goal celebration: "I just throw my hands up and skate to my teammates." Demko (7-1-2, 2.17 goals-against average, .919 save percentage) is the youngest player in the NCAA ranks. He's made a major contribution as a freshman. "I'm extremely excited to have the opportunity to be a part of the Beanpot; there's so much tradition involved and I'm excited to contribute to Boston College's success," Demko said. "I have definitely kept tabs on the tournament, especially in recent years. It's been great to see the success of BC lately. Hopefully, we can keep the streak going." New Jersey Devils goalie Cory Schneider, who participated in three Beanpots for Boston College, offered some advice for the young Demko. "I would just say enjoy it and make the most of it," Schneider said. "Playing in the Garden in front of a big crowd is something you don't get very often in college, so it's those big games that help prepare you for the next level. Have fun knowing that when you do make that jump and turn pro, whenever that may be, you know you've done this before and can face the pressure since you played in the Beanpot." Fellow freshman Savage, who is this week's "Draft Dandy of the Week," has three goals and 11 points in 21 games for the Eagles. "We have our rival Boston University in the first round and to get to play at the historic TD Garden will be something," Savage said. "The atmosphere is unbeatable and it's a great way to bring the four major Boston schools together outside of the regular season. The Beanpot is something all of the schools have circled on their schedule; I'm excited to finally get a chance to play in the tournament." Boston University has won the most Beanpot titles with 29, followed by Boston College (18), Harvard (10) and Northeastern (four). Kingston Frontenacs forward Samuel Bennett returned to the lineup on Jan. 26 for the first time since being tabbed No. 1 on NHL Central Scouting's midterm list of the top draft-eligible skaters in North America. Bennett, who missed five games for the Frontenacs with a lower-body injury, had a goal and one assist in a 6-1 victory against the Belleville Bulls and was named the game's second star. The 6-foot-0.25, 178-pound left-handed center is riding a 25-game point streak, during which he's produced 17 goals and 46 points. Bennett, who was unable to participate in the CHL/NHL Top Prospects Game on Jan. 15 due to the injury, has 27 goals, 68 points and a plus-28 rating in 41 games this season. Hockey fans are sure to get their share of big plays and highlight-reel goals when the men's hockey tournament in the 2014 Sochi Olympics commences Feb. 12. Though the Olympics will surely attract world-wide attention, there's another international event being held 46 miles north of Moscow in Dmitrov next week that will undoubtedly be a haven for NHL scouts seeking that next superstar in the 2014 NHL Draft. The Under-18 5 Nation Tournament, which traditionally has showcased many of the top draft-eligible players each year, will again do just that from Feb. 4-8. The tournament will feature prospects from the United States, Sweden, Russia, Finland and Czech Republic. Goran Stubb, the NHL Director of European Scouting, projects there to be over 100 scouts at the event. "The U-18 February tournament is a very important tournament for the scouts and the prospects since it's the last tournament before the Under-18 World Junior Championship," Stubb said. "In my opinion, the February Under-18 is often more important than the April World Junior since it's an important test for the Europeans thinking of a possible invitation to the NHL Combine [in May]." Of the five participating teams, there are 14 players among the top 141 ranked on NHL Central Scouting's midterm list of North Americans -- all from the United States. Another North American on the team and currently playing for the United States U-18 National Team Development Program, center Jack Eichel, is a likely top five pick in the 2015 NHL Draft. There are 49 international players ranked among the top 127 on Central Scouting's midterm list of European players. Sweden leads the way with 16 ranked players, followed by Finland (15), Czech Republic (10) and host Russia (eight). The top-rated skater at the tournament is right wing Kasperi Kapanen of Kalpa in Finland. The No. 1-ranked skater in Europe has four goals and eight points in 33 games this season. William Nylander, No. 2 on Central Scouting's list of the top draft-eligible European skaters, will play for Modo in the Swedish league until the Olympic break and then return to Sodertalje for games Feb. 9-22. It remains to be seen whether or not Nylander, who has seven goals, 13 points in 11 games with Sodertalje in Sweden's second division, will represent his country in the U-18 5 Nation Tournament. The highest-rated North American goalie is Pennsylvania native Edwin Minney of the U.S. U-18 National Team Development Program. Minney, No. 2 on Central Scouting's list of the top goalies in North America, earned his first career shutout in the United States Hockey League on Saturday, a season-high 38-save, 7-0 victory against the Muskegon Lumberjacks. He made 21 saves in the third period. The 6-4.25, 191-pounder, who will attend Michigan State University in 2014-15, has a 7-1-1 record with a 2.38 GAA and .923 save percentage. United States: Goalies - Edwin Minney (2), Blake Weyrick (3). Defenseman - Jack Glover (27). Forward - Dylan Larkin (17). Sweden: Goalie - Linus Soderstrom (6). Defensemen - Sebastian Aho (9), Markus Pettersson (10). Forwards - William Nylander (2), Adrian Kempe (3), Anton Karlsson (6). Finland: Goalie - Kaapo Kahkonen (2). Defenseman - Joni Tuulola (47). Forward - Kasperi Kapanen (1). Russia: Defensemen-Vladislav Valentsov (33). Forwards-Vladislav Kamenev (8), Pavel Kraskovsky (26). Czech Republic: Goalie - Vitek Vanecek (7). Defensemen - Dominik Masin (18), Filip Pyrochta (28). Forwards - David Pastrnak (4), Jakub Vrana (5), Pavel Jenys (19). Windsor Spitfires forward Joshua Ho-Sang, No. 18 on NHL Central Scouting's midterm list of the top draft-eligible skaters in North America, on Monday was named the Ontario Hockey League's Player of the Week. Ho-Sang is currently riding a four-game point streak during which he's accounted for four goals and 11 points. He has 23 goals, 62 points and a plus-25 rating in 47 games for the Spitfires (29-17-2) this season. He led Windsor to two victories last week, highlighted by a four-point game in an 8-7 shootout win against the Sarnia Sting on Sunday afternoon to extend the team's winning streak to four games. The native of Thornhill, Ontario, was named the game's first star after scoring his first career hat trick before connecting for the shootout winner. He was named third star two nights earlier when he had three assists in a 5-2 victory against the Sault Ste. Marie Greyhounds. Ho-Sang, 18, is in his second OHL season with the Spitfires after being chosen No. 5 in the 2012 OHL priority selection. He played in the Top Prospects Game earlier this month for Team Orr, notching a goal and one assist in a 4-3 victory at the Scotiabank Saddledome in Calgary. 1. Clark Bishop, Cape Breton Screaming Eagles (QMJHL): A first-round pick (No. 3) by Cape Breton in the 2012 Quebec Major Junior Hockey League entry draft, the 5-11.5, 183-pound center has 13 goals, 25 points and a plus-3 rating in 38 games this season. Bishop, No. 48 on NHL Central Scouting's midterm list of the top draft-eligible North American skaters, played for Team Orr at the Top Prospects Game. He is currently out at least two weeks with an undisclosed upper-body injury sustained in a 6-3 victory against the Chicoutimi Sagueneens on Monday. Bishop did chip in with two assists and delivered two hits in the triumph. "A solid two-way center, fluid with good acceleration," NHL Director of Central Scouting Dan Marr said. "He plays a composed game with the puck and has a good shot. He plays with jump and energy and excels on the penalty-kill." 2. Kevin Fiala, HV 71 Jr (SWE): Ranked No. 11 on NHL Central Scouting's international list of the top draft-eligible skaters, the 5-10, 180-pound left wing has 10 goals, 24 points and a plus-11 rating in 26 games in Sweden's under-20 league. He represented his native Switzerland in the 2014 IIHF World Junior Championship, finishing with one goal, five points and six penalty minutes in five games. "Fiala was a key player among the Swiss forwards at World Juniors," Stubb said. "He's a quick, smart playmaker with good hands." 3. Joni Nikko, Lukko (FIN): The 6-2, 194-pound left wing earned a gold medal for Finland at the WJC, producing three goals in seven games. Ranked No. 84 on Central Scouting's midterm list of the top European skaters, Nikko earned a top-six role for the Finns. He has nine goals and 16 points in 32 games with Lukko. "Nikko is a power-forward, hard worker and a late-bloomer," Stubb said. "A team or two might like his straight for the net style and his shot."